and printable copy of this form. Web site 1 day May take longer if John is unavailable. Twitter & Facebook 1 day May take longer if Matt is unavailable. BrooklineCAN newsletter 18th of the month* Newsletters go out on the last day of the month. Press Release 6 weeks There is no guarantee that it will be printed. Email blast 2 weeks Use rarely to avoid overloading readers. 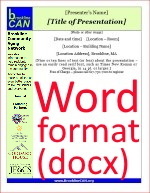 Senior News and Events 12th of prior month Monthly Senior Center print publication. If you want to attach something, this is the place to do it. All attachments optional. 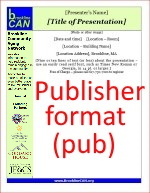 To make sure BrooklineCAN gets credit for events we sponsor, and for consistent appearance, we suggest using this template as the starting point for all flyers. 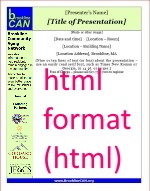 Click an image to download the template.